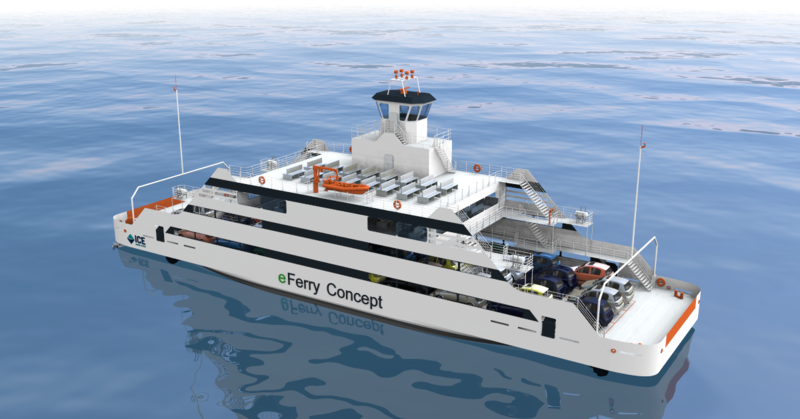 As part of a new ferry service planned by an undisclosed client, ICE has recently developed a design for an all-electric ferry that can carry 200 passengers and 45 cars. The shallow-draft double-ended mono-hull ferry will be propelled by four 750 kW propeller pods, achieving a speed of 15 knots in open water and operating with 10 knots in harbour. Remotely operated battery charging stations will be fitted shore-side on each terminal, which will also be equipped with magnetic pad mooring mechanisms to unmanned moor and release the vessel quickly and securely in a variety of tidal conditions. The project is yet another example of ICE’s effort to stay in the forefront of marine technology.